• ECB has re-widened the rate corridor to 200bp effective on 21 January, reversing its 9 October decision. The move is an attempt to discourage the use of ECB’s deposit facility, revive bank lending, and help normalize money markets. • The move is likely to lead to lower eonia rates and perhaps slightly lower euribor rates. But the effects are likely to be quite small. The widening of the rate corridor also puts pressure on the already hardpressed banking sector. • We do not expect this initiative to revive bank lending, and are somewhat puzzled by ECB’s obsession with the amount on deposit, i.e. ECB would get much better results from proceeding with plans for a clearing house for interbank loans. Fiddling while Rome burns Rate corridor re-widened to 200bp Yesterday the ECB announced that it will re-widen the corridor of standing facilities to 200bp effective from 21 January next year. This reverses ECB’s decision from 9 October last year when it reduced the corridor to 100bp. This means that the marginal lending rate will be 3.5% and the deposit rate 1.5% from 21 January (minus whatever ECB cuts on16 January). The ECB kept the weekly fixed rate tender procedure with the full allotment unchanged. So, unlimited liquidity is still in place. 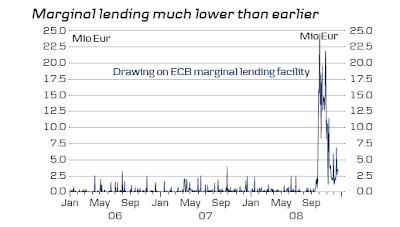 Marginal lending is much less than earlier in the crisis, and the ECB’s decision is mainly aimed at reducing the amount in the deposit facility. Massive amounts are deposited at the ECB facility, which is clearly bothering it. ECB’s aim is to encourage banks to increase lending in the economy and improve the functionality of money markets. The big question is whether it works. The o/n eonia fixing is approximately 25bp lower than the refi rate at the moment. In more normal times eonia on average is slightly above the leading interest rate. The lowering of the deposit rate will probably lower the o/n Eonia fixing somewhat, and hence pull longer eonia rates lower in the process. This may also have a slightly positive effect on euribor rates, as a wider spread makes euribor slightly more interesting. However, there are also effects pulling in the opposite direction. Namely, banks are being punished for using both the lending facility and most importantly the deposit facility, adding to the banking sector’s problems. 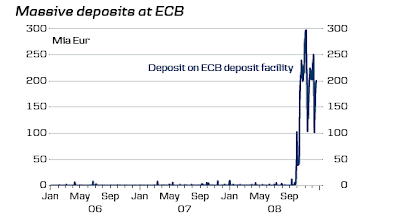 This could lead to less liquidity being drawn in the ECB and hence less being placed on deposit. This would not have any positive effect despite lowering the amount on deposit. 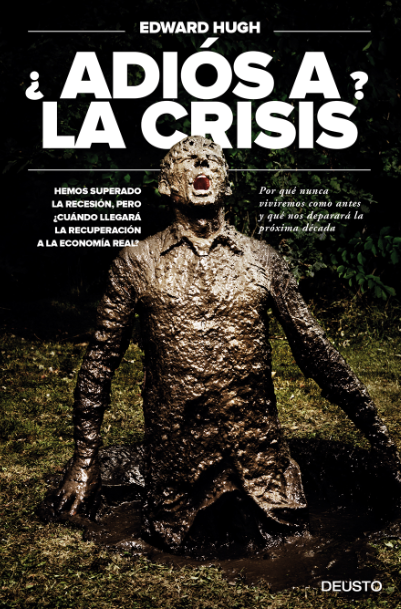 This does not solve much We are very aware of the money market problems and the importance of improving the credit dynamics in Euroland. But this initiative is not a big piece in the solution, i.e. in our view ECB would get much better results from going forward with plans for a clearing house for interbank loans. Should the widening of the rate corridor not significantly lower the amounts deposited at the ECB, further penalties could be in the pipeline. We believe the ECB will cut the refi rate by 50bp effective on 21 January as well. This will take the refi rate to 2%, the marginal lending rate to 3% and the deposit rate to 1%. With the advent of the Euro, the transformation of numerous national markets into a single currency market has provided an excellent opportunity for the development of new benchmarks such as the EURIBOR (unsecured) and EUREPO (secured) indices for the money market. This new environment led to an increasingly homogenous and integrated swap market in the euro area. The growth of the European swap market over the last seven years has also been accompanied by greater diversity in the range of actors using interest rate swaps. The Euro OverNight Index Average or EONIA swap market was one of the most dramatically affected sectors within the financial markets. There has been a dynamic growth in the size of the EONIA swap market in recent years. Tight bidoffer spreads and increasingly high daily volumes have built the basis for a very liquid product. Electronic trading platforms have created even greater price transparency. According to the European Central Bank’s regular money market survey, total trading volume has almost tripled between 2000 and 2006. This sharp increase in volume and the fact that EONIA Swaps are the most liquid segment of the euro money market reflects the benchmark character the EONIA swap market plays within the euro money market derivative product range. 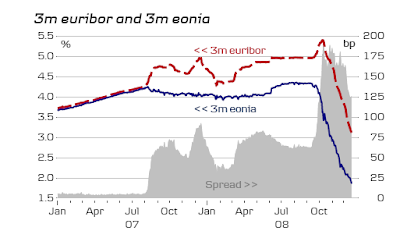 Therefore EURIBOR ACI and the European Banking Federation (FBE) decided to introduce a new Index, the EONIA Swap Index. This new index was established on 20 June 2005, and will further stimulate the overnight index swap (OIS) swap market, with the development of new products derived from the EONIA Swap Index currently in progress. What is an EONIA Swap? An EONIA swap is similar to a plain vanilla interest rate swap transaction i.e. an exchange of a fixed rate interest cash flow for a variable rate cash flow or viceversa. In essence, one interest rate is received, while at the same time the other one is paid. That is, at the time an EONIA swap is concluded, the parties determine the payer and the receiver of the fixed interest rate, with the variable interest rate being exchanged in the opposite direction. Upon settlement, only the net cash flows are paid one business day after maturity. The nominal amount on which the interest payments are calculated is not exchanged. The diagram below illustrates the structure of an EONIA Swap. For example, a payer in an EONIA Swap transaction pays a fixed rate and receives a floating rate pegged to the daily EONIA setting. Do They Have Parachutes In Bulgaria?